Bus from Kuala Lumpur to Bidor is the most cost-efficient and convenient public transport. Many travellers prefer bus over train for travelling from Kuala Lumpur to Bidor. The reason is that there is no direct train service available from Kuala Lumpur to Bidor. Passengers need to take the train to Sungkai, then their friend or family will have to pick them up to go back Bidor. C.S Express, Edaran Express and Unititi Express are few operators offering bus from Kuala Lumpur to Bidor. Edaran Express is the dominant player between them that provides 8 daily trips because Edaran Express is the specialist in this bus route. The bus services provided by CS Express and Unititi Express are passing by Bidor to drop off passengers before continuing the journey to Cameron Highlands. The combined trips by C.S Express, Edaran Express and Unititi Express have 16 departures daily. The earliest departure starts in the morning 8:30AM. The last bus provided by Edaran Express leave the bus terminal at 7:00PM. The average trip duration from Kuala Lumpur to Bidor takes about 2 hours depending on the road's traffic condition. Washroom break will be given upon request to the driver due to the short trip duration. The bus fare from Kuala Lumpur to Bidor is charged in a range of RM 12.40 to RM 17.00 depending on your selection of bus operator. The bus will pick up the passengers at Terminal Bersepadu Selatan, also known as TBS. Terminal Bersepadu Selatan is the transport hub in Kuala Lumpur. Passengers can easily access Terminal Bersepadu Selatan by taking taxi, KTM, LRT and intercity bus. The drop-off point in Bidor is in front of KFC Restaurant in Bidor. 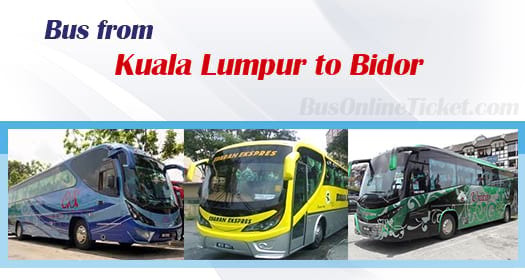 With the limited transportation option to travel from Kuala Lumpur to Bidor, passengers are advised to book online in advance at BusOnlineTicket.com official website or via BusOnlineTicket.com mobile apps. Your booking in BusOnlineTicket.com is instantly confirmed upon a successful payment.